In terms of markets, IAG's bid for Aer Lingus is based on the Irish airline's growing North Atlantic network, its superior links to the UK regions and, to a lesser degree, its continental European presence. In addition to the discussion of Aer Lingus itself, the bid has thrown the spotlight on the strategic merits of Dublin Airport and the competitive battles between contrasting airline models. Ireland and its largest airport, Dublin, have long punched above their weight in aviation terms. Ireland is in the world's top 40 aviation nations ranked by airline seats, but is not even in the top 160 by population. Dublin is only Europe's 25th largest airport but it is home to its largest airline, Ryanair, by passenger numbers. Between them, Aer Lingus and Ryanair - a low cost/legacy hybrid and one of the purest LCCs around - dominate Dublin, whereas the big European legacy airline groups have small market shares and the branded alliances are currently almost non-existent. The airline mix at Dublin is rounded out by regional airlines CityJet and Flybe, in addition to fast-growing global super-connectors Emirates, Etihad and Turkish Airlines. According to data compiled by CAPA from various sources, Dublin ranked as only the 25th biggest airport in Europe by passenger numbers in 2015, with 21.7 million passengers (an increase of 7.7% on 2013). This compares with 73.4 million passengers at number one ranked London Heathrow. Passenger growth at Dublin has accelerated every year since 2011, after double digit percentage declines in 2009 and 2010, although numbers have not recovered to the peak level of 23.5 million seen in 2008. Dublin is Ryanair's second largest base after London Stansted and, according to data from OAG for the week of 1-Jun-2015, Ryanair just edges out Aer Lingus as the largest airline by seat numbers at Dublin airport, with 40% versus its rival's 39%. They are followed, at a considerable distance, by airlines from two of the Big Three European legacy airline groups, British Airways and Lufthansa. The only other airlines with more than 1% of seats at Dublin are local regional airline CityJet, two Gulf airlines (Emirates and Etihad) and SAS. Since both Aer Lingus and Ryanair are currently independent of the branded global alliances, none of the alliances has a significant share at Dublin. Star Alliance is the biggest of the three, with just under 6% of seats, and fractionally ahead of oneworld, while SkyTeam has just 2%. If IAG is successful in buying Aer Lingus, it plans to bring the Irish airline into oneworld, which would then have around 45% of seats at Dublin. The situation is a little different when it comes to share of air transport movements, although Aer Lingus and Ryanair still dominate. According to data published by Airport Coordination Limited, which is responsible for slot allocation at Dublin, Aer Lingus has a clear leading share with 40% of ATMs in summer 2015, compared with Ryanair's 33%. However, although Aer Lingus increased its slot holding by 3% year on year, its share fell from 42% in summer 2014, since the total number of slots at the airport grew at the faster rate of 9%. Aer Lingus added new routes to Bodrum, Monastir, Nantes and Washington and increased frequencies on services to San Francisco, New York JFK , London Gatwick, Paris CDG, but withdrew from Stockholm and Hanover. Ryanair's slot holding grew by 14% and its share of ATMs increased from 31% to 33% as it opened new services to Brussels, Cologne, Copenhagen and Cardiff and grew frequencies to Milan Bergamo, Birmingham, Rome Ciampino, Edinburgh, Krakow, London Gatwick, Madrid, Prague, London Stansted and Berlin. Ryanair has a disproportionate share of seats compared with its slots, reflecting the larger size of its narrowbody fleet versus Aer Lingus (its narrowbodies account for 40 aircraft out of a fleet of 48). British Airways increased its slot holding at Dublin by 60% from summer 2014 to summer 2015, continuing its London City service launched in the intervening winter schedule and taking its share of the total from 2.8% to 4.1%. Together with Iberia and Vueling, the total share of IAG airlines is 4.7%. If IAG were to acquire Aer Lingus, the combined IAG/Aer Lingus share of 45% would further extend the lead over Ryanair in ATM terms. Lufthansa has a slot share of 1.4%, extended to 2.3% if all Lufthansa Group airlines are included (Germanwings, SWISS and Austrian). The Air France-KLM Group is represented at Dublin by Air France, whose slot holding (representing 1.8% of the total) was almost unchanged from summer 2014 to summer 2015, and Transavia France, whose holding increased from virtually zero to a share of 0.2% with its new Paris Orly service. Dublin also has two significant regional airlines, CityJet and Flybe. CityJet was previously an Air France-KLM subsidiary, but is now independently owned by Germany's Intro Aviation and once again led by its founder Pat Byrne. Although its main base is at London City Airport, CityJet is an Irish airline and has its head office in Dublin. London City-Dublin is CityJet's second largest route by seat numbers and its only route from Dublin. In summer 2015, it has reduced its slot holding by 28% year on year, according to ACL data, and its share of the total fell from 3.0% to 2.0%. CityJet withdrew from its Cambridge and Brest services, although it increased capacity to its largest base at London City. The other regional airline with a noticeable presence at Dublin is Flybe. Its slot allocation at the start of summer 2015 was up by 28% year on year, thanks to a new Bournemouth service and the continuation of its Inverness service commenced in winter 2014/2015. However, it withdrew from the Dublin-London City route at the end of May-2015, nullifying much of this growth. Flybe had entered this route, in competition with CityJet, at the start of winter 2014/2015. BA also entered the route at the same time as Flybe and continues to operate it. Flybe operates from Dublin to UK regional airports in Bournemouth, Cardiff, Exeter, Southampton and Inverness. Two of the three Gulf-based super-connectors operate services to/from Dublin, Etihad and Emirates. Etihad grew its slot holding by 17% for summer 2015 against the full summer season last year, although its seat allocation has fallen by 4%. This summer, it is operating with two A330-200s, compared with one Boeing 777-300ER and one A330-200 at the peak of summer 2014. Emirates has increased the number of ATMs operated from Dublin by 59% year on year in summer 2015, with the continuation of a double daily Dubai service commenced in Sep-2014. Turkish Airlines, another super-connector over its Istanbul hub, has grown its Dublin ATMs by 16% year on year this summer. In terms of seat numbers, Dublin is dominated by European services, reflecting the networks of both Ryanair and Aer Lingus (Ryanair has no long-haul capacity and Aer Lingus has just 13% of its seats on long-haul routes to North America). Western Europe accounts for 78.5% of capacity and Eastern Europe for a further 8.6% (week of 1-Jun-2015, source: OAG). At the peak of the summer 2015 season, seat capacity between Dublin and Europe will be 14% higher than in peak summer 2014. Destinations in North America take 10% of seats and seat capacity to this region is up 22% year on year in summer peak 2015. The Middle East and North Africa take the balance of just under 3% of seats and are also seeing strong growth this summer. Peak summer capacity to the Middle East is up 27% year on year and, while peak capacity to North Africa is unchanged, Aer Lingus has extended its Agadir service to year-round and Thomson Airways has extended its Sharm el-Sheikh service to include most of the summer. Capacity to Africa, albeit Eastern Africa, will be increased in Jun-2015 with the addition of an Ethiopian Airlines Addis Ababa service to Dublin as part of a fifth freedom trans-Atlantic operation to Los Angeles (three times weekly Boeing 787-8). Ethiopian has also moved the westbound refuelling stopover for its services from Addis Ababa to Washington Dulles (daily 777-200LR/-300ER) and Toronto (three times weekly 787-8/777-200LR) from Rome to Dublin, but it does not have pick up rights in Dublin for these flights. Dublin has no non-stop destinations in Asia Pacific or Latin America, meaning that Ireland-originating passengers rely on other hubs in Europe (mainly London Heathrow, but also Paris CDG) in order to fly to those regions. With regard to Asia Pacific, this helps to explain the recent growth in Dublin of the global super-connectors Emirates, Etihad and Turkish Airlines. The only one missing is Qatar Airways, but this could change if IAG acquires Aer Lingus, given the close relationship between Qatar Airways and IAG. Although Aer Lingus has remained focused on North America for its long-haul operations, this too could eventually change if IAG is successful with its bid. IAG CEO Willie Walsh has said that Aer Lingus could commence services to India, Japan and China, according to the Irish Independent (1-Jun-2015). This is unlikely to be an immediate priority, but could have some merit in larger markets. Before that, the BA and Qatar networks look likely to increase their involvement in carrying Irish traffic to Asia. The inclusion of Aer Lingus in IAG would also offer opportunities for Dublin to improve its links with Latin America, albeit via a stopover, by increasing its connectivity with Iberia's Madrid hub. Ryanair is the leading airline by seat numbers to Western Europe, with a share of 44% versus Aer Lingus' 41% (week of 1-Jun-2015, source: OAG). 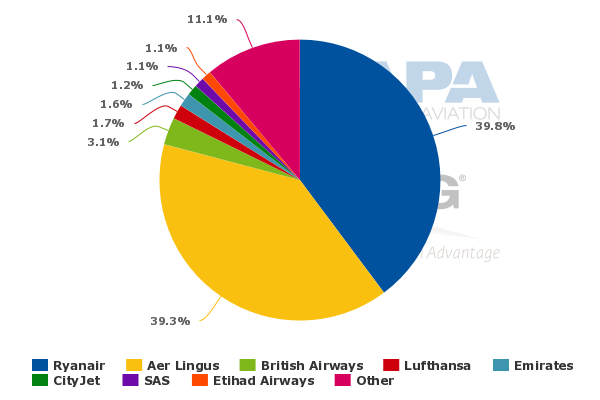 The UK accounts for almost one third of seats to/from Dublin and Ryanair is also the leader in this market, with 46% of seats against Aer Lingus' 37% and British Airways' 10%. An IAG acquisition of Aer Lingus would give the group a greater combined share than that of Ryanair. On routes to Spain, the number two country market from Dublin, Ryanair's 62% share of seats gives it a more pronounced leadership position over Aer Lingus on 32%. In the other larger European markets to/from Dublin, Aer Lingus leads in France, Germany and Netherlands, while Ryanair leads in Italy, Portugal, Poland and Belgium. The only major European market from Dublin in which an airline other than Ryanair or Aer Lingus has a strong share is Germany. Lufthansa and Germanwings together have 29% of seats, compared with 50% for Aer Lingus and 24% for Ryanair on routes between Dublin and Germany. The three leading destination countries for Dublin Airport are the UK, Spain and the US. These are also the three key markets for IAG and its member airlines British Airways, Iberia and Vueling. The list of Dublin's top 10 routes by seat numbers is dominated by UK airports. Heathrow, Gatwick and Stansted make up the top three, with Manchester at number four, Birmingham at number seven and London City ranked 10th. This reflects both the strong cultural and business links between Ireland and the UK and also Heathrow's role in providing long-haul connections to passengers from Ireland. The top 10 also includes Paris CDG (another long-haul hub), two leisure destinations (Faro and Malaga) and New York JFK. Among the top 10 airport destinations from Dublin, Aer Lingus is the leading airline by seats on five routes (Heathrow, Gatwick, Paris CDG, Birmingham and New York JFK), while Ryanair is the leader on four (Stansted, Manchester, Faro and Malaga). CityJet leads on London City, the only airport in the top 10 that is served by neither Aer Lingus nor Ryanair. Aggregating capacity to the various London airports, Aer Lingus is the leader on this city pair, which is by far the biggest from Dublin. 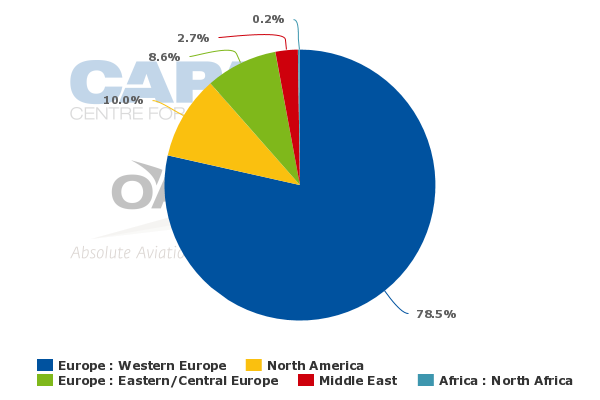 According to OAG data for the week of 1-Jun-2015, it has a seat share of 39%, ahead of Ryanair on 35%, BA on 18% and CityJet on 7% on Dublin-London. Paris is the number two city pair destination from Dublin (in addition to Aer Lingus and Air France services to CDG, Ryanair serves Paris Beauvais-Tille and Transavia serves Orly). Aer Lingus is the leader by seats on Dublin-Paris, with 41% of seats, followed by Air France (25%), Ryanair (23%) and Transavia (10%). Outside Europe, Dublin Airport's most important region is North America, where growth has been strong since Aer Lingus resumed its trans-Atlantic expansion in 2012 and, more aggressively, in 2013. Dublin's geographic location at Europe's western periphery, together with pre-clearance of US customs and immigration for US-bound passengers, position Dublin well to attract trans-Atlantic traffic from across Europe. Dublin is currently the only European airport with US customs pre-clearance facilities, but the US is seeking to expand this to others, including Heathrow, Amsterdam, Madrid, Brussels, Oslo, Stockholm, Manchester and Istanbul. Nevertheless, the spread of pre-clearance to other European airports is unlikely to have a significant impact on demand for Dublin's trans-Atlantic services. Aer Lingus' peak summer 2015 seat capacity to North America will up be 20% year on year. 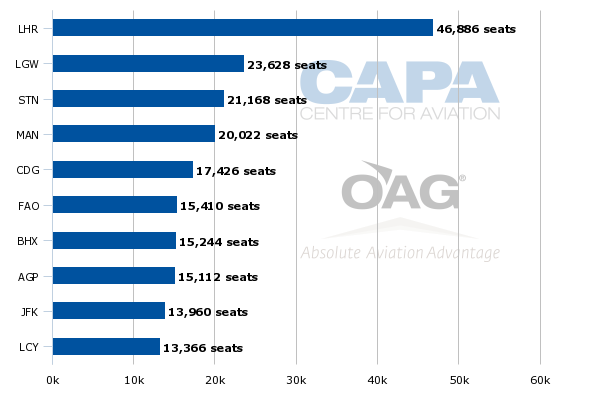 United is growing peak summer seat numbers by 32%, US Air by 14% and Air Canada by 59% (source: OAG). In addition, Canadian LCC WestJet commenced its seasonal St John's service in May-2015 versus Jun-2014. By contrast, Delta and American Airlines have kept their summer 2015 capacity at Dublin broadly stable on last year's levels. There are currently 13 routes from Dublin Airport to North America (week of 1-Jun-2015, source: OAG). These routes involve eight operators: Aer Lingus, American Airlines, US Airways, Delta, United, Air Canada, Air Transat and WestJet. Ethiopian's fifth freedom service to Los Angeles will take the number of routes to 14 and the number of operators to nine later in Jun-2015. A weekly peak summer only Boeing 737-700 service operated by Europe Airpost between Paris CDG and Halifax Stansfield in Nova Scotia will bring these totals to 15 routes and ten operators. Ten of the 14 North American routes from Dublin are monopolies, of which three are operated by Aer Lingus, two by US Airways, one by WestJet and one by Ethiopian. Aer Lingus is the leading airline by seat numbers on six of the seven routes that it operates and, on the seventh (Washington Dulles), it has a codeshare with the leader United Airlines. This codeshare may not survive if Aer Lingus becomes part of IAG, but the inclusion of the Irish airline into the North Atlantic joint venture with American Airlines, BA, Iberia and Finnair would more than compensate for this. The North American network at Dublin, and Aer Lingus' leading position within it, is one of the key attractions to IAG in bidding for the Irish airline. A related feature is Dublin's strong connections with regional airports in the UK (i.e. those outside the London area). There are direct flights between Dublin and 17 UK regional airports, of which 11 have no direct service to any North American city and nine of these also have no connection with London Heathrow. Aer Lingus operates on 11 of the 17 routes connecting UK regions to Dublin, the exceptions being Liverpool, Bournemouth, Southampton, Exeter, Inverness and Belfast. London Heathrow Airport is connected directly to only seven regional UK airports. For many passengers in UK regional markets, Dublin is the most attractive option for accessing North America. 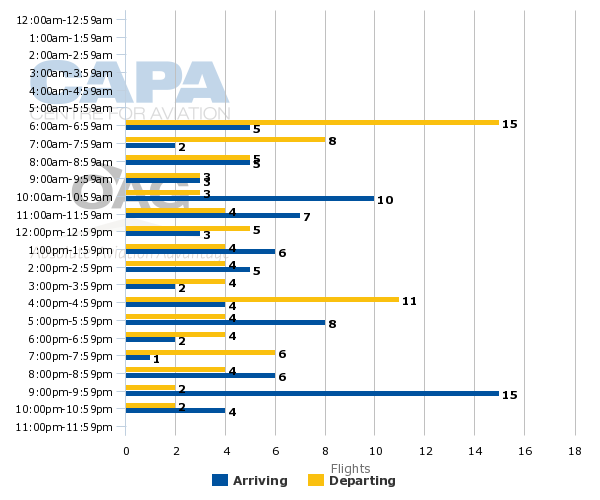 Demand for summer schedule departing slots at Dublin is greatest in the first hour of operation between 06:00 and 07:00, according to Airport Coordination Limited (note that the chart below shows UTC, which is one hour behind local time in Dublin). This is the only hour of the day in which demand exceeds capacity. The second highest level of demand is between 07:00 and 08:00. Early morning departures are valuable in particular for business passengers travelling to European destinations. These two periods of peak demand for departing slots are where Aer Lingus has the greatest number of departing slots. 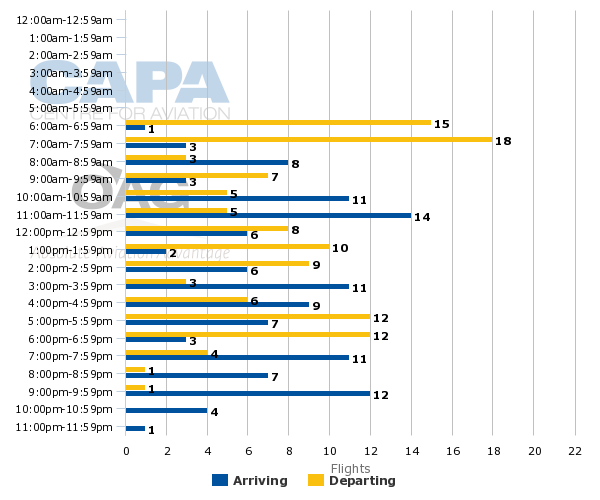 Ryanair also has a significant number of early morning departing slots, but fewer than Aer Lingus from 07:00 to 08:00. Late afternoon/early evening departures are also valuable for business travellers. Again, Aer Lingus has more of these slots than does Ryanair. Ryanair has more early morning arriving slots than Aer Lingus has. These are useful for arrivals from leisure destinations where there is no curfew (or where the curfew ends early). Aer Lingus has a reasonable number of morning slots suitable for trans-Atlantic arrivals by business passengers looking either to do a day's work in Dublin or to have time to make an onward connection. However, if successful with its bid, IAG may look to increase Aer Lingus' early morning arriving slots over time. 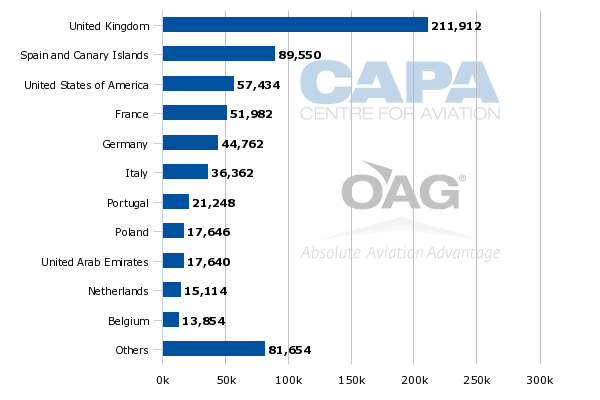 Although it is only Europe's number 25 airport by total passenger numbers, Dublin is number five in Europe for frequencies to North America this summer (week of 8-Jun-2015, source: OAG), behind only the four big hubs Heathrow, Paris CDG, Frankfurt and Amsterdam. In addition, it punches above its weight on routes within Western Europe, where it is number 15 by both seats and frequencies. This is based on its position as the number one airport between Ireland and the UK, on which routes it has more seats and frequencies than all of the London airports combined. Dublin's strong network into Europe, particularly the UK, and its significant and growing trans-Atlantic network are both underpinned by strong cultural and commercial links. The UK and US are Ireland's two largest trading partners and home to large communities of Irish expatriates and Irish-descended inhabitants. These factors have created both significant O&D demand between Ireland and the US and UK and also strong connecting flows between Europe and North America via Dublin. This connecting traffic has been further stimulated by Dublin's geographic location and by the convenience of US customs and immigration pre-clearance. Dublin's links to the US and UK, in addition to other large European markets, have attracted IAG to make its bid for Aer Lingus. These features would both complement and extend IAG's strengths. At the same time, IAG would significantly increase its direct competition with Ryanair, the lowest cost operator and one of the fiercest competitors in Europe. Part of Ryanair's original rationale when it bid for Aer Lingus in 2007 was to use the legacy brand to enter primary airports, but now it is increasingly doing this with its own aircraft and brand. And now the key to the IAG bid's success is in the hands of Ryanair, Aer Lingus' largest shareholder.